Reality check. Life doesn’t slow down. At least not in my experience. You think life will get simpler, but it really only ever gets harder. I think we live with this expectation that some day life will “return” to what it once was. What it was before something big happened that introduced some busy. Having a baby is one example. We spend our baby years believing that once our babies have gotten older, we will have more time. Life seems to only succeed in getting busier as time goes on. Moms are busy. It doesn’t matter if you are a working mom, work from home mom, or a stay at home mom, you are a busy! You have things to do but also want to be a part of your family’s life. We want to be more than background noise in our children’s memories! 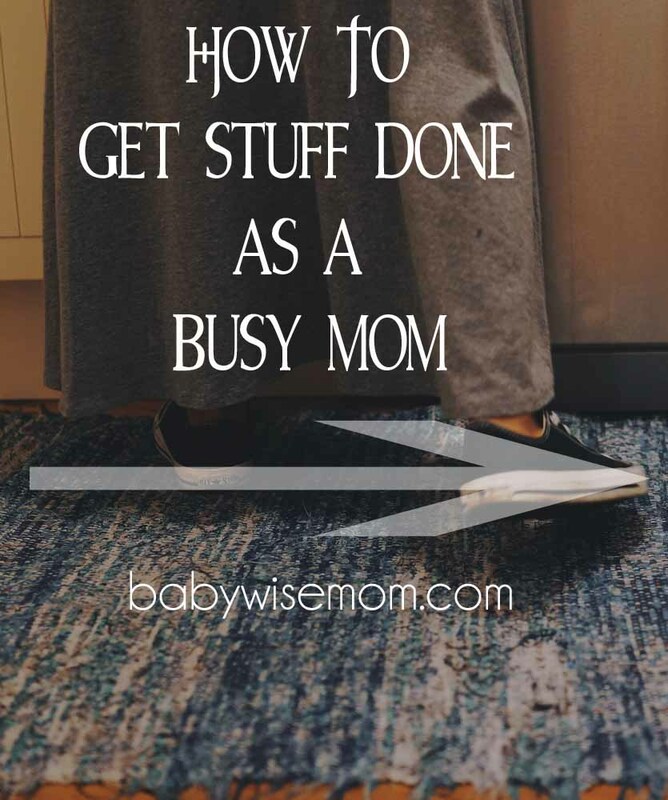 A huge difficulty as a mom is to find ways to stay up on your necessary house tasks while still allowing time to be a mom in ways other than a housekeeper. 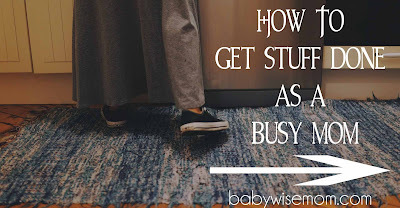 This post isn’t intended to give you the pep talk on “spend time with the kids, not time cleaning.” Yes, we all want to spend time with our kids, but we do also have things we need to do each day, and that is okay! The trick is figuring out how to best accomplish those things so there is still time to fulfill other roles in your life. Here are some tips on getting those tasks done efficiently and with wisdom. I find it very helpful to have a cleaning plan and schedule. I have certain days I clean certain things each week. I also make a plan for what additional things I want to get done during the week. To see more details on how I manage my chores throughout the week, see this post: How I Do It: Chores. To see how I plan my meals, see this post: How I Do It: Meals. I keep lists of things I need to get done. I have always been a list maker, and I have noticed as I have gotten more children and as my children have gotten older and busier, I really need lists just to free up some head space! I can’t keep it all in my head. I used to do lists with paper, but I now use my iPhone. I put stuff in my list as soon as I think of it. I initially used my Notes on the iPhone. I now use two different apps. For my personal “to-dos” I use Mom’s Daily Planner by Yadahome.com. I just use the free version and so far only use the “to-do list” function. It has been very helpful for me in organizing my to-dos. I can categorize and prioritize my lists. I can assign due dates and look at what is only due that day, which makes the list more manageable I can also look at the entire list of what I have open if I need to. For keeping the entire family on the same schedule, my favorite app is Cozi. We also use the free version of this. My husband and I have the same app, and when I put something in, it updates on his phone as well. We keep our family calendar on it. We also keep our shopping lists on it. You can also have “to-do” lists on Cozi (good place for a honey-do?). Lists help me keep track of everything I need to get done and where I need to be. I find that when I start my day with scripture study, I am able to get so much more done in my day. I have found this to be true ever since I was a teenager, and I never miss an opportunity to share about it. Put it to the test! It took me until my third child to figure this one out. Don’t clean all day! When you have young kids, you can easily spend the day following them around and cleaning everything up as they go. Then you get frustrated when a new mess is made because you just cleaned that area! One Dad I know was left to be a “stay at home dad” for a week while his wife was away. He started complaining about cleaning all day and I told him to just let it go. You will find you are a nicer parent when you pick once or twice a day to focus on picking up the house. See more on this under 9 below–Work as a Family. Now, you want to balance this idea with the good practice of having your children clean up after themselves. With young children, you need to help them clean. So you do want to instill good habits of cleaning up after themselves, but that doesn’t mean you follow them around cleaning the trail they leave behind them–that is not teaching good habits. This one isn’t very popular, but if you can get up early, you will find you are able to get so much more done in a day! Getting up early means you are up before your children, and we all know doing things without the help of our children is much faster and easier than doing it with the help of our children :). So, even just an extra thirty minutes in the morning could do a lot for your “to-do” list. My main goal for my house these days is just to keep things presentable–keep things in a state that if I had an unexpected visitor, I wouldn’t be totally embarrassed. This is definitely easier said than done, and I have plenty of embarrassing visits, but it helps give me an end-goal that I can focus on for each day. I once had a friend comment on Facebook about how much faster she worked when company was coming over. Isn’t that so true! If you want to clean your house in a hurry, pretend company will be there in 15 minutes. Clean like crazy for those 15 minutes. When I decided a few years ago to stop cleaning all day long, I figured the best time for things to get very clean was right before bedtime. My children are all required to help clean up before bed. Everyone helps clean, then we do our bedtime routine, then the kids are put in bed, and the house is clean for about 12 hours! A great thing about doing this is that the children think about what kind of mess they are making because they know they will be cleaning it up. You don’t have to do this before bed–you can pick any time of day. Sometimes you just need to hire it out. Many families I know who have both parents working find hiring someone to come in and clean 2-4 times a month well worth the investment. I “hire out” my children to help me with deep cleaning–I used deep cleaning as the jobs they can do to earn money. You might find there is something you want to hire out, whether it is a neighbor teenager, a professional, or your own children. As life gets busier, work to figure out how to make it doable for you. Adjust things here and there to be able to still get chores done around the house but still be present with your childre.